Additional Info: Susannah has just completed her MMus course at Trinity Laban Conservatoire of Music and Dance, studying with Anna Pope and Lynda Coffin. 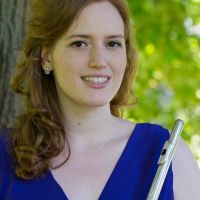 Whilst at Trinity, Susannah has played in the Trinity Laban Symphony Orchestra side-by-side schemes, where she has been able to perform alongside professional flautists from Philharmonia Orchestra and Welsh National Opera. She has also participated in masterclasses with Emily Beynon, Wissam Boustany and Paul Edmund-Davies. Performing with various orchestras and ensembles, Susannah has played at Blackheath Halls, St John’s Smith Square, Institute of Contemporary Arts and St James’ Piccadilly, among other venues. Susannah has a keen interest in chamber music and plays in the London- based flute quartet Incanto Flutes. Susannah graduated from Royal Holloway, University of London with a BMus in 2014. Throughout her degree she received lessons with Susan Milan. Registration is completely free and allows you to create an informative, searchable online profile at FluteProfiles.com.